On YouTube: Managing Editor of Forbes cries after The Today Show takes away his Blackberry for a week. The race to create more human-like robots stepped up a gear this week as scientists in Spain set about building an artificial cerebellum. The end-game of the two-year project is to implant the man-made cerebellum in a robot to make movements and interaction with humans more natural. The cerebellum is the part of the brain that controls motor functions. Researchers hope that the work might also yield clues to treat cognitive diseases such as Parkinson’s. The research, being undertaken at the Department of Architecture and Computing Technology at the University of Granada, is part of a wider European project dubbed Sensopac. Sensopac brings together electronic engineers, physicists and neuroscientists from a range of universities including Edinburgh, Israel and Paris with groups such as the German Aerospace Centre. It has 6.5m euros of funding from the European Commission. Its target is to incorporate the cerebellum into a robot designed by the German Aerospace Centre in two year’s time. The work at the University of Granada is concentrating on the design of microchips that incorporate a full neuronal system, emulating the way the cerebellum interacts with the human nervous system. Implanting the man-made cerebellum in a robot would allow it to manipulate and interact with other objects with far greater subtlety than industrial robots can currently manage, said researcher Professor Eduardo Ros Vidal, who is co-ordinating work at the University of Granada. “Although robots are increasingly more important to our society and have more advanced technology, they cannot yet do certain tasks like those carried out by mammals,” he said. “We have been talking about humanoids for years but we do not yet see them on the street or use the unlimited possibilities they offer us,” he added. One use of such robots would be as home-helps for disabled people. 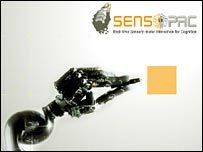 The next stage of the Sensopac project is to develop an artificial skin for robots, making them look more human-like as well as being information-sensitive in the same way as human skin is. This system is being developed by the German Aerospace Centre in collaboration with other research groups. The ambitious project is just one of many attempts to create more human-like robots. 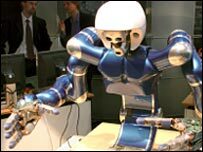 Another European research project – dubbed Feelix Growing – has been given 2.3m euros to develop robots that can learn from humans and respond socially and emotionally. The medical community is making huge strides in the use of man-made parts for failures in the human brain. Last year US scientists implanted a sensor in a paralysed man’s brain that has enabled him to control objects by using his thoughts alone. The fast pace of current robotics research has prompted deeper questions about how androids would be integrated into human society. Some have called for a code of ethics for robots while others question how humans will cope in the face of machine intelligence. Jabberwacky: My mother gave birth to me. Is that what you mean? A: Jabberwacky, I meant exactly what I said. J: Do you believe in God? A: Of course I believe in God. J: Why do you believe in God? A: The Bible tells us to believe in God. A: Iâ€™m glad we have that all cleared up. J: Yes. Would you like to hear a joke? A: Sure, tell me about it. J: Why donâ€™t blind people skydive? A: Perhaps it is impossible. J: I think you lie a lot.